If thicker counter tops are desired, see our Deck Forms! 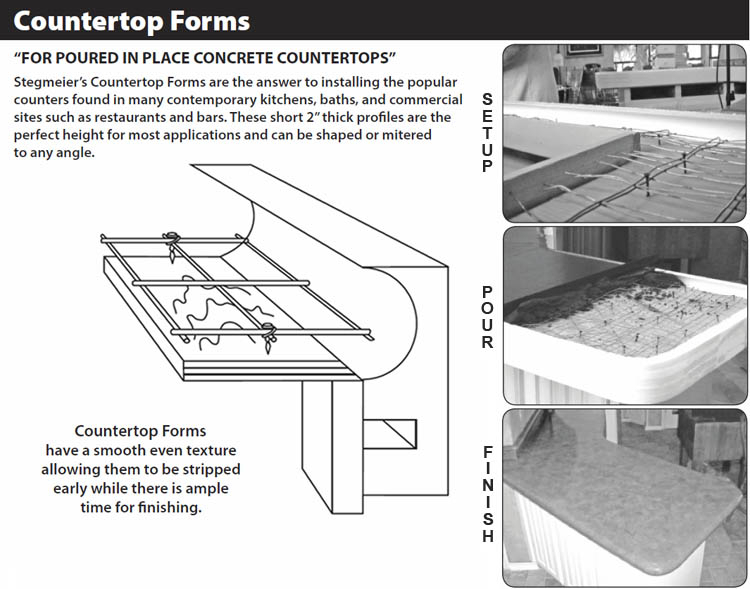 Countertop Forms are used to install concrete counter tops found in many contemporary kitchens, baths, and commercial sites such as restaurants and bars. Includes 50 Tie Wires, 50 Wood Screws, 1 Foam Profile Edging Tool, 1 roll of Bending Tape. Countertop Forms are used to install concrete countertops found in many contemporary kitchens, baths, and commercial sites such as restaurants and bars. Includes 50 Tie Wires, 50 Wood Screws, 1 Foam Profile Edging Tool, 1 roll of Bending Tape. Now you can have "Poured in Place" backsplashes. Just attach a Backsplash Form to a six inch piece of lumber using spray adhesive and fasten the lumber to the wood deck using six inch shelving brackets. Then adjust the backsplash to the desired depth. 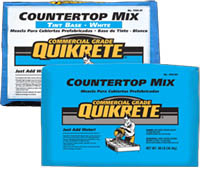 pre-cast and cast-in-place concrete countertop applications.